Home > Blog > Questions & Answers > When Do You NOT Need an Attorney? When Do You NOT Need an Attorney? There are many ways a personal injury case can get complicated, and hiring a personal injury attorney can certainly help. 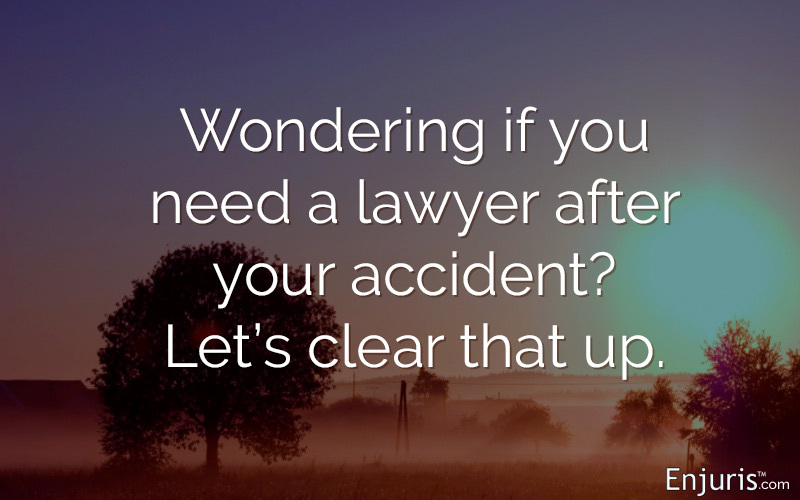 While it may seem like you will need to hire an attorney whenever you have an accident, that’s not necessarily the case. Insurance companies may very well try to cut your compensation and if severe injuries are involved, you will certainly want to give an attorney a call. However, in some situations, it’s hard to justify paying a third of your winnings to hire an attorney to handle your case and injuries. We’ve written a longer article that goes into detail about many instances where an attorney isn’t necessarily needed. Here’s a quick rundown of what you need to know. If your accident doesn’t involve any injury, then it’s likely not worth it to file a personal injury claim or enlist the help of an attorney. It’s advised that you should always seek medical attention, however, even if you don’t believe you’ve had injuries. A doctor will be able to tell you if you’ve suffered injuries that may not have shown up right away. Do not make a decision about hiring an attorney until you have been thoroughly checked by a physician. Your insurance company may want to settle, and the amount may be fair. If you feel this is the case, it may not be worth hiring an attorney. Hiring an attorney could lengthen the negotiation process, and they will require a payment of a third of your winnings. If the settlement seems fair, hiring an attorney may not be worth it. If you aren’t sure whether your insurance company is misleading you, asking an attorney in a free consultation can help. Sometimes, you can tell that your recovery will likely be small and your case may do best in small claims court. In small claims court, you aren’t required to have legal counsel present, although you are able to if you desire. While it depends on the situation, attorneys may act on a fee basis in small claims court rather than the typical contingency fee of a third of your winnings. Sometimes the small recovery amount simply isn’t worth hiring help. If you still aren’t sure, the majority of attorneys will offer a free consultation and can answer any questions you may have about whether or not hiring them will be worth it in the long run.